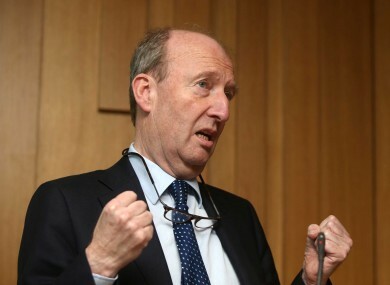 SHANE ROSS HAS said he is considering “naming and shaming” drink drivers in the same way tax defaulters are. The Transport Minister told RTÉ’s News At One a database of people who have been convicted of drink driving is one of several measures his department is reviewing in a bid to tackle drink driving. Ross described 2016 as a “disastrous year” for road safety – 187 people lost their lives on Irish roads last year, 25 more than in 2015. In a crackdown on drink driving over Christmas, gardaí arrested over 730 people on suspicion of driving under the influence of alcohol – a 34% increase on December 2015. Ross described this increase as “pretty alarming”, adding that the message about not drinking and driving “hasn’t got across, whatever the reason is”. He said the upward trends in road deaths and drink driving arrests need to be tackled immediately and “in a very concrete way”. Ross said there will likely be an increase in garda presence on our roads in 2017, noting the extra powers gardaí now have under the Road Traffic Bill 2016, which was passed by the Oireachtas last month, such as allowing them to test drivers for drugs at the roadside. Ross is looking into disqualifying everyone who’s found to be over the limit, saying he wants to end the practice of first-time drink driving offenders paying a fine and getting penalty points, but avoiding being banned from driving for a period of time. The minister said he is also considering decreasing current drink driving limits. He said “serious measures” are needed to “stop the carnage” on Irish roads and save people’s lives. Ross added that people are “living in a fool’s paradise” if they think drink driving has been addressed, saying the issue is particularly bad among young men. Meanwhile, a Fine Gael MEP has called for breathalysers to be installed in the cars of repeat drink drivers. Ireland South MEP Deirdre Clune, a member of the EU transport committee, said she is concerned at the spike in road deaths last year and the increased number of arrests for drink driving offences. She wants Ireland to follow a number of European countries who have introduced the measure, such as Belgium, the Netherlands, France, Sweden, Denmark and Poland. “Alcohol interlocks are automatic control systems which are designed to prevent driving with excess alcohol by requiring the driver to blow into an in-car breathalyser before starting the ignition. The alcohol interlock can be set at different levels and limits, but not by the driver. Most countries who use the programmes use both mandatory court imposed interlocks but also voluntary where someone convicted of a drink driving offence may opt to install and pay for an alcohol interlock in exchange for a lesser fine or driving ban. Clune added that studies have shown that alcohol interlocks have reduced repeat drunk driving offences in Europe. The government’s Road Safety Strategy 2013-2020 requires Ireland to undertake a cost benefit analysis for the use of alcohol interlocks as a sanction for repeat offenders. The Road Safety Authority is currently examining this option. Email “Shane Ross considering 'naming and shaming' drink drivers like tax defaulters”. Feedback on “Shane Ross considering 'naming and shaming' drink drivers like tax defaulters”.